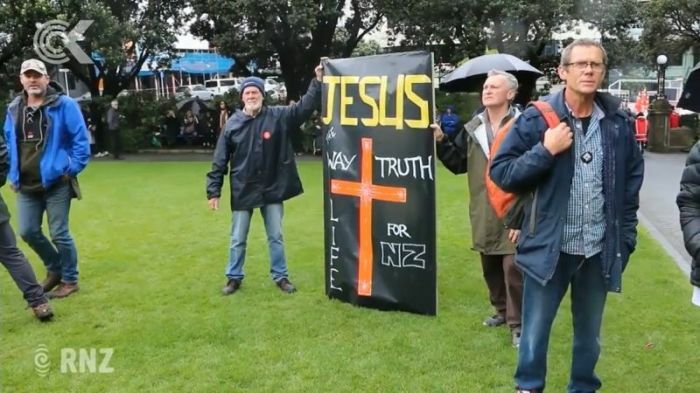 Close to 1,000 Christians protested outside of Parliament in New Zealand on Tuesday, condemning as "Judas" the speaker's removal of all references to Jesus Christ in prayer. The change to the parliamentary prayer was enacted in November 2017 when Labour's Trevor Mallard took over the speaker role. Mallard decided to remove all references to Christ in the prayer, describing it as a "compromise," as the phrase "almighty God" remains. Some of the protesters on Tuesday held signs reading "Dishonorable Judas Mallard," referring to the disciple who betrayed Jesus. Event organizer Ross Smith told Radio New Zealand that the country's Christian heritage should not be erased. "It's a legacy. The principals and the values that are in this nation are based on our Christian-Judea roots," Smith said. He added that adherents of other religions were also supporting the protest. "So for instance Muslims come in and they say, 'Listen, don't take the name of Jesus Christ out, where's the integrity in that?'" Smith asked. "Other people coming in expect us to uphold our values and stick by them — they actually appreciate that." Deputy Prime Minister Winston Peters meanwhile said that the entire parliament should have been allowed to decide whether to remove Jesus' name from the prayer. "Well the decision as to what should be changed should be made by parliamentarians and not the speaker — that's our position, I don't mind telling you publicly," Peters said. "If you're going to make a change let's have Parliament decide — not one person." National Party leader Simon Bridges also argued that Mullar should have consulted with others first. "What happened here is Trevor Mallard didn't consult and he should have done that. I think it really comes back to that, and I think if he [had] he would have come to a different position," he said. "I don't think it was his decision to make alone." Prime Minister Jacinda Ardern, who is not religious, backed Mullard's move, however. "I think that having the prayer in itself sets a good tone for Parliament, but it has been done in a way that the speaker has tried to make a bit more inclusive," Ardern said. Christians have rallied on a number of occasions over the issue, including back in January. "We feel that the Church does not have a voice in this change and we are here to change that," Smith said at the time. "Numbers speak to Parliament and this rally may be the only way to keep Jesus in the prayer. That is why we are calling for all Christians to be a part of this movement," he added. New Zealand has been identified as one of the most secular countries in the world, with national census data from 2013 finding that only 48.9 percent of the population identify as Christians.